Argocats cross rugged land with ease. 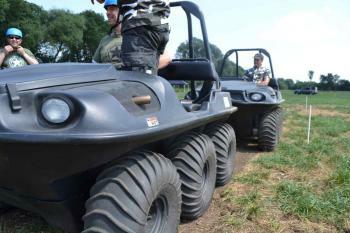 Water hazards, steep hills, bumps, mud, grass, gravel – these are no match for an Argocat! With two levers to steer accelerate and brake, you can steer like a tank. Navigate your Argocat around an obstacle course in a challenge designed to test precision driving and speed. These versatile vehicles are options in our Country Sports, Motorised and Club Adrenaline events. If they take your fancy we are able to include them in the event of your choice. As with other motorised vehicles, not all venues permit their use, talk to our events team for suggestions of motorised venues near you.